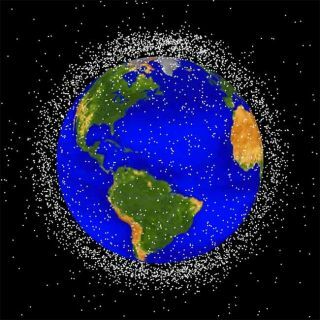 The orbits around Earth are cluttered with chunks of space junk? high-speed riffraff that poses a growing threat to robotic satellites andhuman-carrying spacecraft. There are currently hundreds of thousands of piecesof space debris greater than 1 centimeter wide whizzing around in space. Butwhile this space litter may be out of sight, out of mind for most of us, a newreport on orbital debris has flagged potential solutions to deal with the threat. The report anchors its space cleanup thinking and approachesto more down?to-Earth woes like acid rain, hazardous waste, chlorofluorocarbonand oil spills. The same superfund approach to those earthly pollutionproblems could be reworked to tackle space junk, according to the report, whichis titled "Confronting Space Debris - Strategies and Warnings fromComparable Examples Including Deepwater Horizon." Superfund is the federalgovernment?s program to clean up the nation?s uncontrolled hazardous wastesites. The monograph, compiled by the nonprofit global policy thinktank RAND, was prepared for the Defense Advanced Research Projects Agency. At the core of the RAND report is an analysis of howindustries on Earth have approached their pollution problems, and how thoselessons can be applied to cleaning uporbital debris. Behavioral norms (past and/or present) do not address the problem in a satisfactory manner. If the problem is ignored, the risk of collateral damage will be significant. There will always be an endless supply of "rule-breakers." The problem will likely never be considered solved because the root cause is difficult to eliminate. One observation from the report is that the space Superfundcould serve as an effective model for orbital debris cleanup. A Superfund for space would make space polluters pay forcleanups while creating strong incentives for nation-states and privateindustry to take appropriate preventative steps to avoid creating additional spacedebris. Also, the report stresses that the entire space communityneeds to agree that purposely creatingorbital debris is not acceptable behavior. "We tie orbital debris to things that were moreintuitive, things that people sort of run into on a daily basis," saidDave Baiocchi, co-author of the report. "We purposely tried to tie thespace debris problem to some environmental issues?to start making someconnections in people?s heads," he told SPACE.com. Baiocchi said that the environmental calamity of the 2010 DeepwaterHorizon oil spill in the Gulf of Mexico was a saga that brings a keymessage home. "We didn?t quite have our act together for DeepwaterHorizon," Baiocchi said, citing technological trial-and-error that doggedattempts to curb the underwater hemorrhaging of oil. "Maybe we don't quitehave our act together for the space debris problem either." Perhaps the biggest lesson of that oil spill, as pointed outin the report, is that simply having a remedy available, or several, is notsufficient. They must be tested and proven to work in the expected operatingconditions. Likewise, any future orbital debris removal tactic must betested to make sure that it will work in the operating environment of space. RAND co-author, William Welser IV, added that nobody has agood idea of what the environment looks like up in space. The report explains that when a problem?s effects are notdirectly observable, a community is likely to misjudge the risk posed by theeffects. "You can have millions and millions of gallons of oilthat has spilled. But you can't see it?until you see those birds that arecovered with oil or you see the actual spill come to the surface. Until thathappens, the public is not excited or worried about it," Welser told SPACE.com. "As soon as a DIRECTV satellite gets knocked out ? or aGPS satellite or some other space asset we use ? then you?re going to have alot of people up in arms about space debris," Welser said. What about the inadvertent February 2009 spacecollision between a defunct Russian weather satellite and an active Iridiumsatellite? Or China?s purposeful 2007 anti-satellite test that spewed so muchlingering debris that ? now over three-and?a-half years later ? poses distincthazards to hundreds of operational satellites? They weren't very good wake-up calls, responded Welser. "The level of impact was not there," Welser said,in terms of public awareness or loss of commerce, whereas loss of a major assetin a war and a thousand troops die as a direct result ? that's a tangiblewake-up. However, as the report explains, these two events are likelythe cause for the increased interest ? including the RAND research ? in theorbital debris problem. In addition, remedies are needed to clean up theconsequences of such shattering events. Developing the pathfinder technology now for such a remedy"may prove to be a wise decision" because on-orbit collisions arelikely to continue to occur in the future, the report states. There are a number of spacecleanup ideas floating about ? such as using garbage scows, tethers, laser beams,giant foam balls and such. While outside the scope of their report, Baiocchi said,"it's really a matter of devoting resources. Eventually, you?re going toget something. The hard part is convincing your friends in other countries thatwhatever you stick up there isn?t a weapon." As for an orbital debris tool kit, RAND researchers warn notto put all your technological eggs in one basket. "You?re probably going to need more than one ofthem," Baiocchi said. "You absolutely have to test your technologiesin the environments in which they are going to be used." "The biggest warning," Welser added, "is notto lull yourself into a false sense of security just because you think you havea tool set" ? a tool set that hasn't been tested under actual operatingconditions. Welser noted that the group of people in the orbital debrisresearch field is still very small. "That community has stayed small overtime while the community that?s been affected on a day-to-day basis by spacesystems has grown exponentially," he said. There's a need to do a better job of relaying to the commonperson that relies on space that the problem of orbital debris is gettingworse, Welser concluded. "We need to be concerned about this."